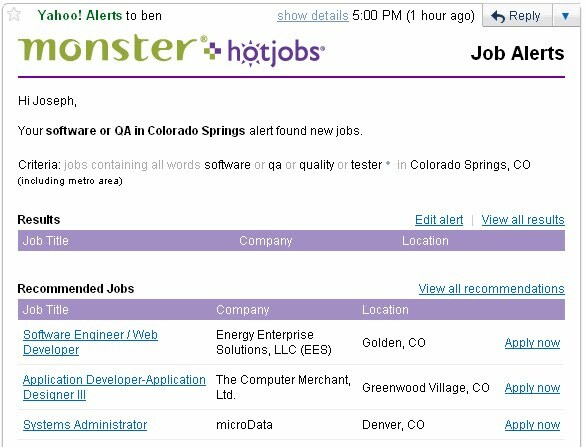 I received the following alert email from HotJobs informing me that new job listings have been posted that match one of my saved searches. Notice a problem? The search results section is blank. If it found new jobs matching the search criteria, it isn't showing me what they are. If it didn't find new jobs, then it is sending emails proclaiming it found something it didn't find. Who's Joseph, are you sure that's your search? Could there be another alert setting that supperseeds the number of results found? What I'm trying to say is - probably there is another setting for the email alert that says 'send me emails everyday' regardless of the number of jobs found.